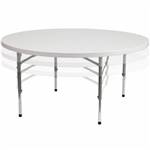 Discount Prices for Round Commercial Plastic Folding TablesWholesale Plastic Folding Tables have a blow-molded surface making the our Tables exceptionally durable and lightweight. Whether you need a Plastic Folding Table for heavy, ongoing use or you need some extra temporary tables, these Discount Plastic Folding Tables are both convenient and economical.. Our Tables are rated at 1,500 pounds, evenly distributed on the blow-molded surface. PRICES INCLUDE 8% TARIFF IMPOSED BY OUR PRESIDENT. Lowest Prices for Plastic Folding Round Tables are great for churches, schools, or offices, The Plastic Folding Tables are commercial brand and very durable.. WHOLESALE Plastic Folding Tables constructed of high quality resin and strong folding steel legs. Wholesale Folding Tables When you purchase folding plastic tables , you will be receiving high quality products that will last for years if taken care of properly. We also offer our customers a five year warranty on all folding tables--both resin and plywood. Plastic Folding Tables come in all sizes and shapes, We have Plastic Round Tables with 2” Solid Tops, We also have Banquet Plastic Folding Tables. Plastic Folding Tables are affordable, durable and come with a 5 Yr Warranty. Our best customers for Plastic Folding Tables are Churches, Schools, Sports Teams, Restaurants and Renal Companies. Wedding Venues also love our Plastic Folding Tables. Our Customers Service Team works with our Customers of insure they are purchasing the correct Plastic Folding Table for their individual needs, Our Wholesale Plastic Folding Tables were chosen by the U.S. Military after testing all the available Plastic Folding Tables. Prices for Plastic Folding Round Tables are great for churches, schools, or offices, The Plastic Folding Tables are commercial brand and very durable.. WHOLESALE Plastic Folding Tables constructed of high quality resin and strong folding steel legs. Wholesale Folding Tables When you purchase folding plastic tables , you will be receiving high quality products that will last for years if taken care of properly. We also offer our customers a five year warranty on all folding tables--both resin and plywood. ies. Wedding Venues also love our Plastic Folding Tables. Our Customers Service Team works with our Customers of insure they are purchasing the correct Plastic Folding Table for their individual needs, Our Wholesale Plastic Folding Tables were chosen by the U.S. Military after testing all the available Plastic Folding Tables.